Radiation is a form of energy that is present all around us. There are different types of radiation. All may cause us harm with strong exposures. Some types, called ionizing radiation, may cause harm over time even at low exposures. This radiation is released by radioactive materials which are measured in units called curie. The dose of radiation that a person receives is measured in units called millirem. Radioactive materials and radiation-producing machines give off a form of energy that travels in waves or particles. This energy is called radiation. When a person is exposed to or comes in contact with radiation, the energy goes into the body where it may cause harm. For example, when a person has an x-ray, they are exposed to radiation. How can radiation exposure occur? People come in contact with small amounts of radiation every day, both from naturally occurring sources—such as elements in the soil or cosmic rays from the sun—and human-made sources. Human-made sources include some electronic equipment (such as high voltage power supplies and microwave ovens), medical sources (such as x-rays and certain diagnostic tests and treatments), nuclear power plants, and nuclear weapons testing. How much radiation are people exposed to? The amount of radiation from natural or human-made sources that people come in contact with is usually small. Scientists estimate that the average person in the United States receives a dose of about 620 millirem per year. The annual dose to people varies, depending on where they live, whether they live in a home with radon in indoor air or drinking water, or whether they had medical x-rays or nuclear medicine procedures in the past year. About 50 percent of human exposure comes from natural sources, including radon, and the remaining 50 percent comes from human-made sources—mainly medical x-rays and nuclear medicine. The most appropriate actions will depend on the situation. Tune to your local Emergency Alert System radio station or TV station for information and instructions from State of Vermont's health, safety, and emergency management departments. You may be advised to shelter in place, which means to stay in your home or office, or you may be advised to evacuate. These protective actions are meant to stop or limit your exposure to radiation, and stop or limit contamination. What is radiation exposure and contamination? Radiation is the hazardous energy emitted by radioactive materials and is responsible for dose. Contamination is radioactive material where it is not wanted. Dose from radiation stops when you move away from radioactive materials. Exposure to contamination stops when the radioactive materials are removed. Some types of radioactive materials stay in the body and are deposited in different body organs where they remain for days, months or years. Other types are eliminated from the body more quickly in blood, sweat, urine and feces. The National Council on Radiation Protection and Measurements has captured our average dose in the chart below that shows how much radiation comes from each of the many contributors. What is Vermont’s Potassium Iodide Distribution Program? The State of Vermont makes potassium iodide (KI) tablets available free of charge to people who work or reside in the Vermont towns within the Emergency Planning Zone (EPZ) for the Vermont Yankee Nuclear Power Plant. 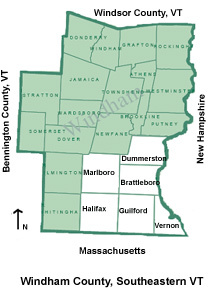 The towns that qualify for free KI include: Brattleboro, Dummerston, Guilford, Halifax, Marlboro and Vernon. Parents and guardians are eligible to receive a free dose for each child in their family. Participation in this program is voluntary. Public schools, nursing homes, hospitals, and some child care centers and private schools in these towns also have KI distribution plans in place. The Potassium Iodide Program will stop after December 31, 2019 because the current lot of KI will have expired. This is acceptable because Vermont Yankee’s spent fuel has been moved into spent fuel casks and most of the fuel’s radioactive iodine has decayed away. Radioactive materials give off a form of energy that travels in waves or particles called radiation. When a person comes in contact with radiation, the energy gets into the body. The Radiological Health Program evaluates and manages the actual and potential public health impacts on Vermonters from activities at the Vermont Yankee Nuclear Power Station in Vernon, VT.
X-ray instruments are insepected regularly, and x-ray facilities are licensed to protect the public from unnecessary exposure to radiation.